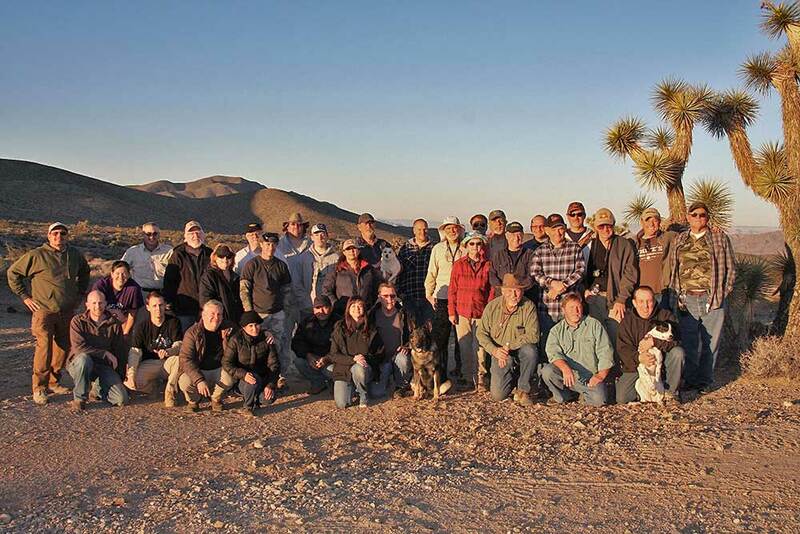 In honor of the 20th anniversary of the discovery of the Gold Basin strewn field (Nov. 24, 1995), about 30 meteorite enthusiasts from around the US southwest got together for a group hunt and some camping (photo above by Jim). The event was organized by my friends Richard and Dave. 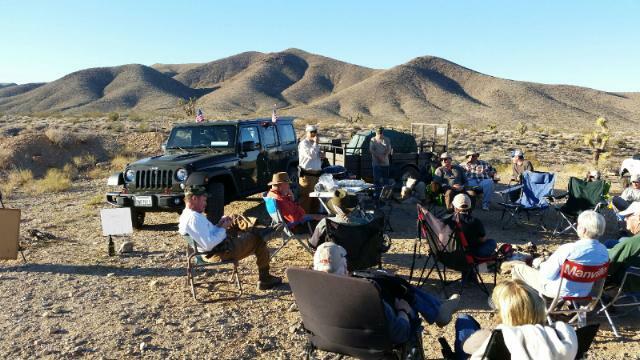 In the photo below Richard addresses everyone in camp after the second day of hunting and hands out awards for the biggest and most finds (photo below by Dave). The coyotes in the area are no dummies, as soon as everyone left camp they showed up looking for some tasty treats. The Gold Basin strewn field starts out in the south below the Lake Mead National Recreation Area. The west end of the Grand Canyon is only about 20 miles to the east, and tour helicopters flew past the area all day long. Several people found meteorites, the largest was over 200 grams. I didn't manage to find any, but there's always next time. On the way home Mark and I stopped at the Franconia strewn field for a couple hours of hunting. We hiked a couple miles up "Iron Alley" before the batteries in my metal detector died. I had a spare set, but they turned out to be dead, too, so we hiked out to the middle of the strewn field where I would hunt by eye. In the photo below Mark swings his detector beneath a lucky rainbow. We turned back to the truck just after 2pm, and about 40 minutes later I couldn't believe what was sitting on the ground in front of me. I yelled back to Mark several hundred feet away, "I GOT ONE!". I was so excited, this area has been heavily hunted for years and to just stumble across a meteorite sitting out on the surface like this was super lucky. At 68.05g it was my largest meteorite find to date. I plucked the space rock from the ground where it had been resting since before the pyramids were built. I look pretty rough after 3 days in the field, but this little space rock made it all worth every step.